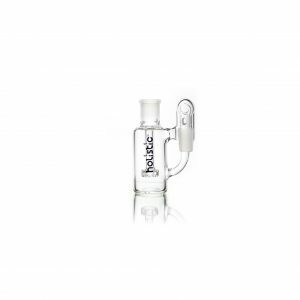 Holistic ash catcher, 3/4″ barrel perc, 90 degree recycler arm. 90 Degree 18mm Ash Catcher w. Stacked Barrel Perc & Recycler Arm. This 5.5 inch 90 degree ash catcher with a stacked barrel perc features a 18 millimeter male joint going into the waterpipe and a 18mm female at the joint for the bowl. 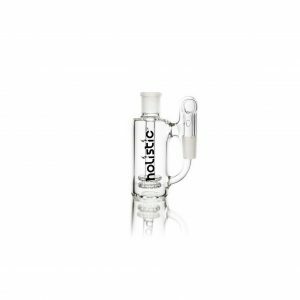 The recycler arm along with the stacked barrell percs allow the smoke to cool and filters out the bad stuff with minimal drag, allowing for a smooth hit every time. The 90 degree arm allows it to sit perfectly on most pieces with a 90 degree joint slot. 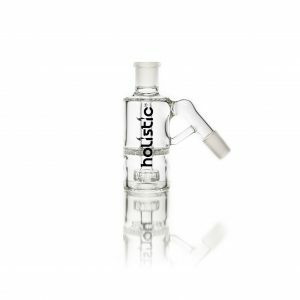 We at Holistic pride ourselves in two things: The quality of our glass and how well our pieces filter smoke. You don’t have to look further than our ash catchers for evidence of this. Most companies may look at ash catchers as a simple way to keep your pipe clean. 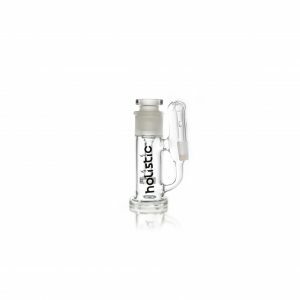 Our ash catchers are all made from the thickest, highest quality glass, and every single one contains at least a single perc in it, if not more. 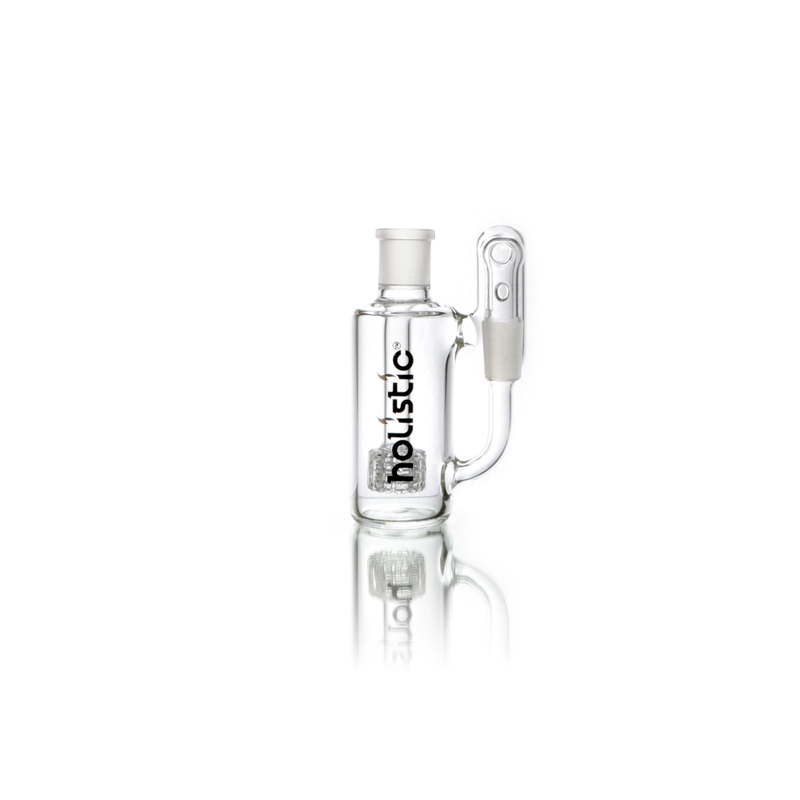 This ash catcher specifically includes 1 stacked barrel perc in it’s filtering chamber. It also has a recycler arm, which will cycle the smoke back through the ash catcher before it even reaches the pipe. 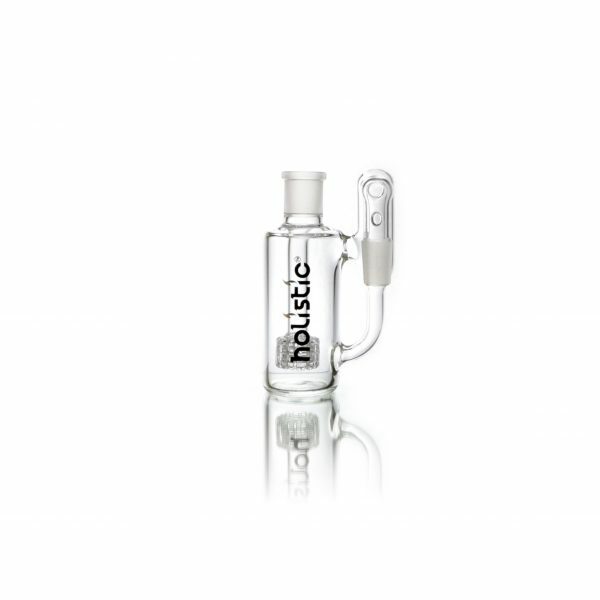 Not only will this ash catcher keep your pipe clean, it will clean your smoke better than most bubblers. Also available with a 14mm joint size.